Congratulations! You have already sewn some small projects and are set to move on to sewing your own garment. Perhaps you are now getting ready to sew your first dress and looking forward to wear your first creative sewing expression. And if you are a bit nervous that it will not turn out perfect, don’t fret. We all make mistakes, but working with certain fabrics for beginners could make your first sewing project a sure success! As you start to go beyond the invisible border of buying clothes and getting ready enter the wonderful world of sewing, it is important to know that there are fabrics that are more adaptable than others. Generally one of the most manageable fabrics to work on is cotton. This versatile fabric can be as light as a handkerchief or heavy like a canvas and is the fabric of choice for shirts, skirts, trousers, jeans and dresses. Fabrics can either be woven or knitted. It can be also be made from animal fibers, plant fibers or man-made fibers. Since knitted fabrics stretch more than woven fabrics, this makes them harder to manage –so let’s start sewing with woven fabrics first, like moleskin and smooth corduroy, which are almost always made from cotton. These fabrics are also relatively cheap. Stay away from cotton jersey though, because it is a fabric that is knitted by machine from fine cotton threads, making it quite stretchy and not as easy to work with. Heavy-weight cotton fabrics like denim may also be a bit difficult to manipulate. Have a look at our article on Tips for Sewing Denim if you want to have a go. 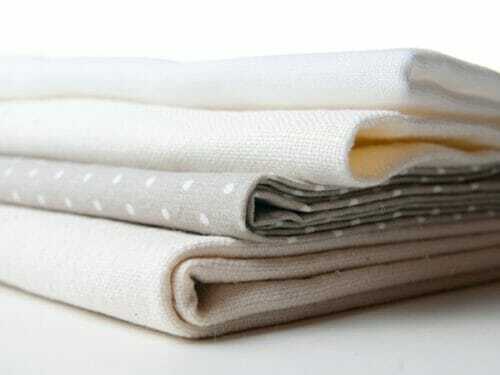 Woven linen is also ideal for your first garment project. It’s available in a variety of weights and is great for summer wear. Take note that linen, which is often blended with cotton, tends to crease a lot and can be a bit expensive. Therefore the best project for beginner using linen are tunics, sleeveless blouses and loose shirt dresses, pajama pants. For a fun and easy project please take a look at our super easy tunic, the perfect project to built your sewing confidence. If you want to sew a skirt, you can also opt for woven wool for that posh look, but this fabric is fairly expensive. 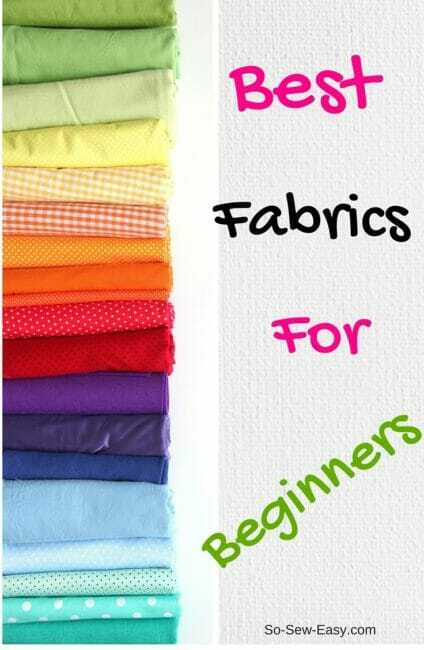 Synthetic or man-made woven fabrics like polyester and polycotton are definitely recommended as fabrics for beginners. Crease resistant and lightweight, they are cheap and manageable. Finally, cotton velvet is stable and is great for skirts and simple but glamorous jackets. As a general rule, woven fabrics like cotton, linen and cotton-linen blend are great choices as fabrics for beginners because they do not slip or stretch that much. Stay away from knitted fabrics like shiny polyester, silk, rayon and cotton jersey for now. If you really want to have a go with knits, please check out our article Sewing with Stretchy Knits for some guidance. Try to use light- to medium-weight fabrics too and remember that heavy fabrics with bumpy ridges are hard to manipulate. And make sure to choose fabrics with plain colors or small prints since stripes, checks and fabrics with large patterns are tricky in laying them out. Before you venture into knits, try your hand at slippery fabrics that are easier to manipulate, at the top of your list should be challis. It’s also best to buy your sewing pattern first. Choose your fabric later because patterns will help you know not only what kind of fabric you’ll need, but also how much fabric you should buy too. After choosing your fabric, you can then buy notions like buttons, thread and zips to match. We have a comprehensive list of The BEST Online Fabric Shops if you're looking for fabric. If you did all these steps, you are now ready to make your first garment. And before you know it, you will be wearing your first creation. Have fun sewing! Above are some of my suggested looks for this summer. Which ones would you like to see us release as free patterns on So Sew Easy? Let me know what you think! Thursday outfit and the Sunday top. Love the Wednesday outfit. Looks comfortable. I love the Tuesday dress! I would make it in all different colors…one for each day of the week. I love the skirt for Saturday, I went shopping in town today and those pleated skirts were everywhere and looked so good. Not for a beginner like me though. I also like the Sunday top but with a longer sleeve, and the very similar Friday dress, that’s great as well. Thank you for your site, I’ve only just found you. Hi Liz, I will make a tutorial that will change your mind about pleated fabrics I promise. So get our equipment ready and you will end up with a beautiful skirt. I have taken notes on the rest. thank you for your comment. 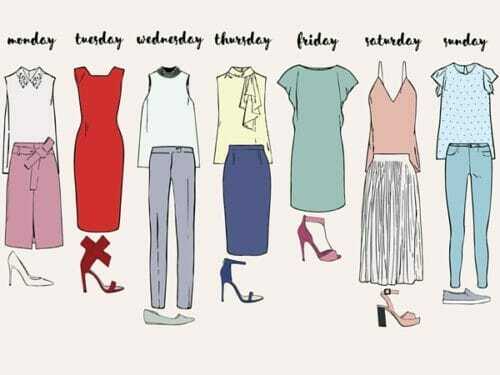 I really like Wednesdays slacks and Fridays dress. Love the top on Sunday!! In the picture of the tunics, is there a pattern for the one with the flower on it? I like the style. Yes I have it, I am writing the tutorial for it so stay tuned. Thank you!